T.E. 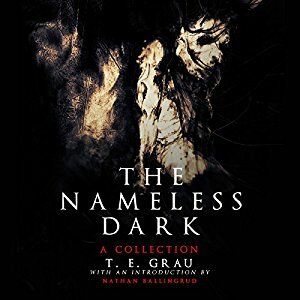 Grau’s debut collection, The Nameless Dark, has received high accolades from many outlets, not least of which is This Is Horror, where we reviewed it last month. It would be redundant to go into lengthy detail about the contents of the book, but we would be remiss to fail to talk a bit about the wonderful Audiobook read by Armen Taylor. Grau’s book is one of those excellent collections of weird fiction that we’ve been so fortunate to encounter this year, his language flowing and beautiful. Grau’s prose is poetic, often almost lyrical, and Taylor’s narration is a perfect fit for it, his voice as dark and rich as the stories he reads. Armen Taylor is an excellent narrator for many reasons, first and foremost being the aforementioned voice. In addition to that, his enunciation is perfect and his timing is spot on, with dramatic pauses in all the right places, his voice rising and falling to adjust the tension level and create the sense of foreboding that is present in all of Grau’s stories. And Taylor is a great dramatist, his vocalizations of character dialogue well fitted to whatever character he’s channeling, and his ability to take on different accents convincingly adding to the already excellent and entertaining flow of the book. If you like your fiction weird and poetic, and your preferred mode of consuming it is audio, you can’t go wrong with this outstanding and captivating narrative.